This property has just been renovated inside and out to bring it up to date. A modern, smart and comfy house trapping all day sun. 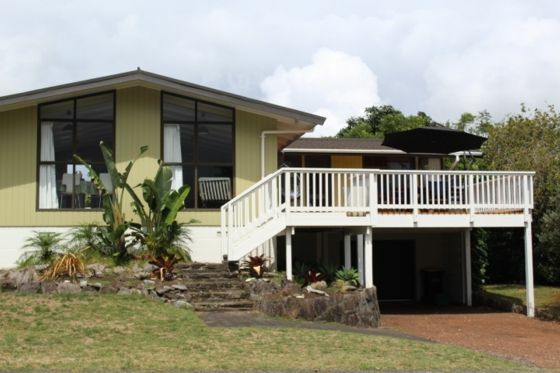 Fabulous location just a few steps from the estuary for those water activities or walking. A quiet street with a reserve right across the road. The house is roomy and has a good flow inside. Three bedrooms and good easy flowing living areas. Generous size garage. Well equipped kitchen with super large sunny decks both North and South facing for all day / year sun. Large private back yard. There is a walkway right outside the door to take you to the middle of Pauanui and a 5 minute stroll to the beach. Some pets allowed with prior approval. (no dogs please). No smoking. 2 x queen bed, 2 x single beds. Min booking of 8 nights over the Xmas and New Year period. Cooking essentials provided on a fair us policy. Please replace as required. Tidy well laid out property. Tidy well laid out property. Well stocked with crockery, cutlery and appliances. Good shower pressure. Very comfortable. Fantastic clean and fresh property in a great location for the estuary, beach and around a 25min walk to the shops. Would recommend. Spacious living / dining area. Spacious living / dining area. Two good decks to enjoy. Quiet street. 1 minute walk to estuary, and about 10mins to the jetty. Being close to the Estuary was great with little kids who found the surf a bit rough. Being close to the Estuary was great with little kids who found the surf a bit rough. Liked being able to use the adult bikes. Great Bach in a lovely location. Great Bach in a lovely location. Property was very clean and tidy and with everything you need.